Apple's first fiscal quarter results set a world record for quarterly profits (not inflation adjusted) for public companies, according to S&P. Apple generated $18B in profits (+30% YoY), dwarfing the previous record set by Exxon Mobil, which earned $15.9B in the second quarter of 2012. For a mature company of Apple's size, a 30% YoY growth is staggering, and it's their best performance since 2012.
, which made up 69% of their total revenue. Revenue from their Mac business also showed a steady growth, in a market where pc sales have been declining rapidly. But iPad sales continued to shrink as customers are upgrading to newer models of iPads more slowly than they upgraded iPhones. The company sold 21.4 million iPads in the quarter, down 18% from 26 million in the quarter a year ago. Though most of Apple’s revenue in the quarter came from the Americas, where Apple reported $30.6 billion in sales, sales in China generated $18B in revenue. Over the last couple of years, Apple has made a series of moves to compete more aggressively in China. In late 2013, it reached an important deal to sell iPhones with China Mobile, the largest wireless network in the world, with more than 800 million subscribers. There was a pent up demand for larger screen iPhones. While almost all OEMs on the android side had moved over to 5 inch or higher displays, Apple had vehemently stuck to their 4" displays. By launching the iPhone 6, Apple has regained a portion of these customers who had previously defected to other OEMs, as well as an additional share of new customers, who now can compare different phones without screen size being an issue. You would expect that as a product mature, and faces stiffer competition, average selling prices and margins would drop. Incredible to see Apple managing to increase their high selling price. Some factors were launch of the more expensive iPhone 6 Plus and Apple intentionally disconnecting the 32 GB variants, and nudging customers away from the entry level 16 GB variants to the more expensive 64 GB SKUs. were generated by Apple, with a meager 12% shipment share. 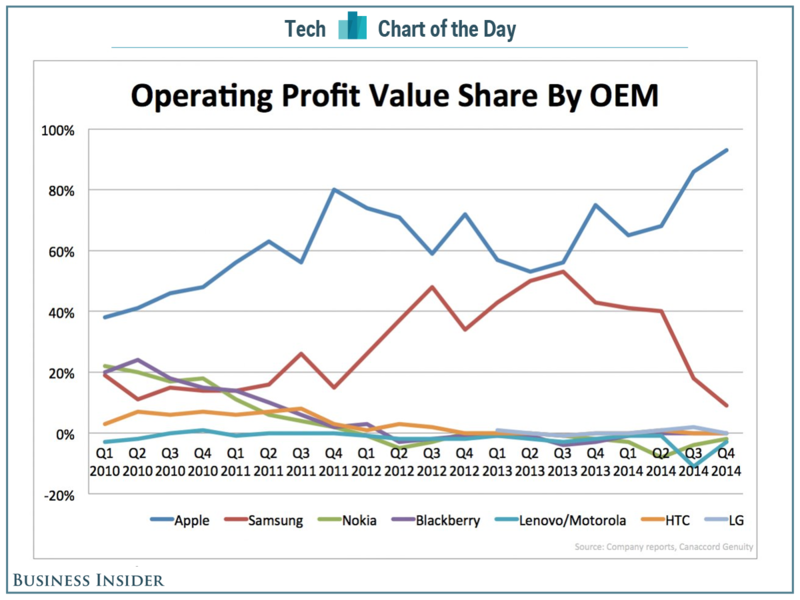 Profits for Samsung has nose-dived in recent quarters, along with other OEMs struggling to make any substantial profit. Overall, Apple had a great quarter, though many investors would like to see Apple’s revenue be more diversified. This is raising some of the expectations for Apple’s coming entry into the smartwatch market, which is all set to be released in April. It will be interesting to see if Apple can maintain the same momentum in coming quarters. Though realistically, it will be extremely hard for Apple to outpace this record growth, on an already large profit base.